The 2012 Parsons Festival will show off work by the school's fashion, design, and art students and faculty. Parsons kicks off its second annual festival today in high style with a runway show and installation from the School of Fashion at Parsons and an evening benefit honoring Parsons alumna Donna Karan and the chair of Parsons’ board of governors, Sheila C. Johnson, an entrepreneur and philanthropist. The benefit, held at Pier 60, Chelsea Piers, streams live to the Sheila C. Johnson Design Center and via the Parsons website. The event is just one of the highlights of the festival, which celebrates a wide range of work by students from all of the programs at Parsons. Parsons Festival 2012 includes an exhibition from the Parsons Scholars program, a three-year college preparatory program for New York City public high school students interested in art and design. Design Mix, a networking event for students and alumni who work in creative industries, gives students a chance to connect with their professional peers and learn about career paths. The goal of Parsons Executive Dean Joel Towers was to create a focused, participatory event leading up to graduation and the end of academic year,, said Hosking. Interactive installations reflect this goal; exhibitions feature digital labels enabling visitors to link directly to a website supplying information on the artists and designers whose work they are viewing. Interact, a daylong symposium on civic engagement held on May 12, explores the varied partnerships with communities, nonprofit organizations, and governmental agencies that Parsons students and faculty have undertaken in their work. 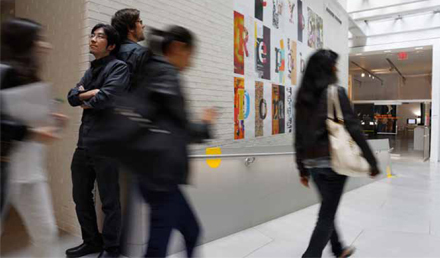 To learn more about Parsons Festival 2012, visit the festival website.